Assurance of learning refers to processes for demonstrating that students achieve learning expectations for the programs in which they participate. Schools use assurance of learning to demonstrate accountability and assure external constituents such as potential students, trustees, public officials, supporters, and accrediting organizations that the school meets its goals. Assurance of learning also assists the school and faculty members to improve programs and courses. 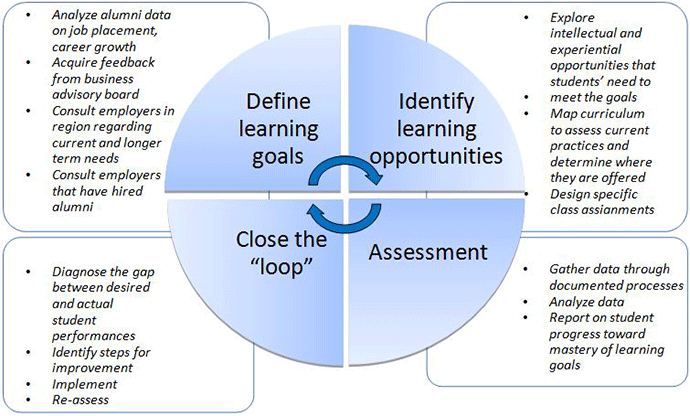 By measuring learning, the school can evaluate its students' success at achieving learning goals, use the measures to plan improvement efforts, and (depending on the type of measures) provide feedback and guidance for individual students. For assurance of learning purposes, AACSB accreditation is concerned with broad, program-level focused learning goals for each degree program, rather than detailed learning goals by course or topic, which must be the responsibility of individual faculty members. Our students will be able to write effectively using appropriate language and business conventions in order to be understood in the business environment. Our students will be able to identify issues and problems, gather and interpret relevant data, evaluate assumptions, develop informed solutions and conclusions, and articulate consequences of proposed actions. Related to critical thinking, our students will be able to collect, analyze, synthesize and present data. They will demonstrate ethical conduct related to the use of data. Our students will recognize ethical dilemmas, respond sensitively to parties involved, and translate ethical considerations into appropriate managerial action. Our students will have the ability to identify, apply, and utilize mathematical and statistical concepts, techniques, and tools to derive meaningful conclusions based on an analysis.